Yesterday I was accused of being a flirt. I know. Shock. Horror. I was hurt. I rebuked the label and flung a few of my own back. What a cheeky….and then I thought about it. 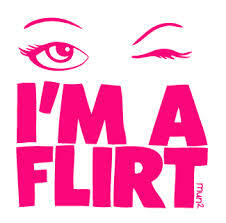 Maybe, just maybe I do flirt without even realising I do it? Or maybe the things one does could be misinterpreted as flirting. Who knows but here are some surefire signs that you MAY be flirting. 3) Your voice is an octave higher than when you’re talking to colleagues or friends. 4) You touch your hair and body a lot more than usual. 6) You find yourself looking at his lips and wondering how he kisses and licking yours or reaching for the lip balm in preparation and not hearing what he says and ….er, yeah. Your eyes can’t hide all of that. 7) You bring your hands to your chest drawing attention to your cleavage more than is necessary. 8) You find yourselves talking about relationships and not much else but what you’re really doing is 3rd partying. 9) You ask hypothetical questions like, “So if we were to date…” and then give non hypothetical answers before both going quiet. 10) Other people come to talk to you and you quickly get rid of them and get back to….flirting. 11) He calls you on your flirting and you deny it and he accuses you of lying and you laugh but still deny it. 12) He tells you that the next time you have me time you will think of him….and you believe him. 13) You find yourself blushing. 14) You don’t need to get numbers because you have mutual friends. This so isn’t over…. Haha…. You a flurtttttt gurl!